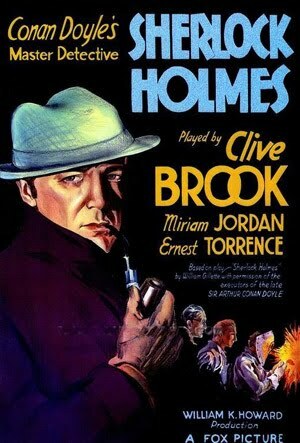 Sherlock Holmes, the 1932 film, starred Clive Brook as the immortal detective. If you can believe it, Holmes is about to get married and move to a chicken ranch! This is definitely an updated movie, since Holmes would have been in his late 70’s by 1932. But you know that Holmes can’t retire to that chicken ranch yet. Prof. Moriarty has escaped from jail and has sworn to kill Holmes, the prosecutor, the judge and the Scotland Yard detective that sent him to prison. Holmes, of course, had promised to give up chasing crooks but with Moriarty on the loose again must re-enter the fray. 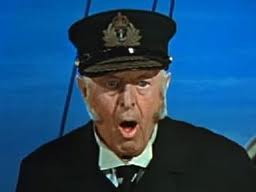 Reginald Owen is immediately recognizable to millions of old movie buffs. He was born John Reginald Owen in Hertfordshire, England on 5 August 1887 and died of a heart attack on 5 November 1972. Owen appeared in 80 feature length films and had a total of 143 film and TV performances. Owen made his stage debut in England in 1905 but was performing on Broadway by 1924. In 1929 Owen made the leap to Hollywood and became one of the best known character actors of the 20th Century. Owen had two very great distinctions as a film actor. 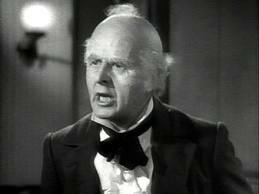 He was perhaps the best known of all Scrooges, starring in the role in the 1938 classic “A Christmas Carol” and more importantly for us; he is one of only four actors to play both Holmes and Watson. 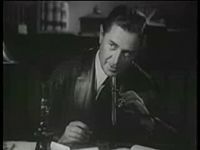 He starred as Holes in the 1933 movie “A Study in Scarlet”, with Warburton Gamble as Watson. The other three actors to play both roles were Jeremy Brett, Carleton Hobbs and Patrick Macnee. This entry was posted in Doyle, Holmes, Watson and tagged Reginald Owen. Bookmark the permalink.